On this page we will provide angular 2 custom event binding and EventEmitter example. Angular framework provides event binding using in-built event as well as custom event. Event binding is achieved using parenthesis () and on- keyword. When using parenthesis (), we need to write our event name inside it. When using on- keyword, on- is added as prefix with event name. Custom events are the EventEmitter instances. To create a custom event we need to create an instance of EventEmitter annotated by @Output(). Then this instance calls emit() method to emit payload which can be received by event object $event. In our example we are taking a parent child component communication example. In this example to send data from parent to child component, property binding will be used and to get data in parent component from child component, custom event binding will be used. Now we will discuss our example step by step using TypeScript. 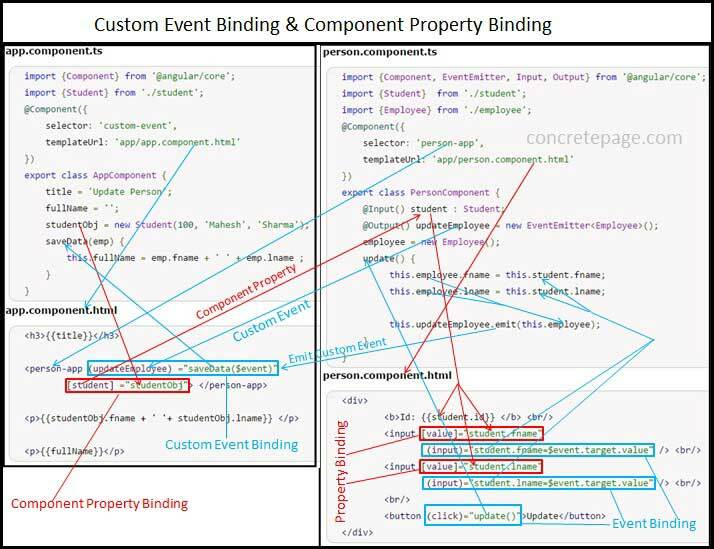 Find the diagram for custom event binding and component property binding. Arrow in light blue color is showing flow of custom event binding and arrow in red color is showing flow of component property binding. We will observe that the light blue arrow direction for custom event binding is from person.component.ts to app.component.ts and for component property binding red arrow direction is from app.component.ts to person.component.ts. Find the steps involved in custom event binding and component property binding. 1. In the above diagram we are performing parent child communication using custom event binding and component property binding. app.component.ts is behaving as parent and person.component.ts is behaving as child. The child selector person-app will be used to create a custom element in parent component. Component property binding and custom event binding will take place in person-app element. 2. In AppComponent we are creating an object of Student class as studentObj. In PersonComponent we are creating an input variable as student of Student class type. @Input decorator is used to mark a variable as input variable. 3. In app.component.html we are performing component property binding between the objects studentObj of AppComponent and student of PersonComponent in person-app element. 4. In person.component.html the object student is providing its value to text box using element property binding. 5. When user changes values in text box then on input event the values of student object is getting changed. Here input event binding is taking place. $event.target.value returns current input value by user. 6. In component property binding if the object sent to child is being updated then the reference object in parent will also get updated because they are pointing to the same object. So when student object of PersonComponent is getting updated then at the same time studentObj of AppComponent will also get updated. It means student and studentObj both objects are always in sync. In property binding it happens only in case of object of a class and not in case of primitive data type such string, number. 7. On click of update button, update() method of PersonComponent will be called. Here click event binding is taking place. 8. 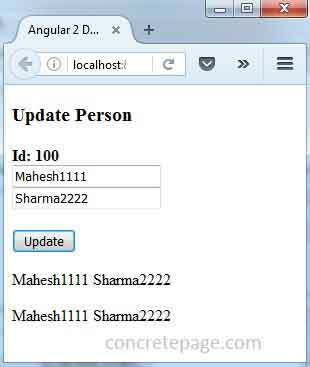 The object updateEmployee of angular EventEmitter class works as custom event binding name. @Output decorator is used to mark a variable as output variable. EventEmitter has emit() method that emits the payload. 9. The execution of code updateEmployee.emit() will invoke custom event binding and will send employee object to custom event binding. Custom event is taking place in app.component.html . When updateEmployee event fires then it calls saveData() method of AppComponent. $event contains the payload sent by emit() method that is employee object. 10. In the output we are printing studentObj and fullName of AppComponent using interpolation in app.component.html. Here studentObj and student object will keep same values even after student object changes by user update in text box. EventEmitter is a class in angular framework. It has emit() method that emits custom events. We can use EventEmitter in custom event binding. To achieve it first we need to import it in our component file as given below. And then initialize it using @Output decorator as follows. Here Employee is our TypeScript class. @Output() defines an output variable. updateEmployee will be a custom event name. Using emit() method of EventEmitter class we emits Employee object to parent component in custom event binding as follows. The object emitted by emit() method can be accessed using event object $event. Suppose we want to create a custom event named as updateEmployee. So first of all we need to instantiate an instance of EventEmitter in the variable updateEmployee as below. We need to annotate it with @Output that declares it as output variable. Custom event binding is used in parent child component communication. Here we will send data from child component to parent component. To send data we need to use emit() method as below. Now we are ready to use variable updateEmployee as custom event. Event binding can be done using parenthesis () or on- keyword. Find event binding using (). Now we will use on- keyword for updateEmployee event binding. In the above code snippet [student] ="studentObj" is working as a property binding to send data from parent component to child component. For our demo we are creating two sample classes using TypeScript as follows. We will create the instance of Student class in our parent component and will send it to child component using component property binding. Then we will set data to Employee class instance in child component and will send it to parent component using custom event binding. Find child component file used in our example. @Input(): Defines input variable in component communication. It is used to communicate from parent to child component using property binding. @Output(): Defines output variable in component communication. It is used to communicate from child to parent component using custom event binding. In our component file we have created a method update() that will call emit() method. update() method is being used in our HTML template as given below. In our HTML template we are binding student object with HTML elements using property binding. We are also using DOM input event binding to fetch current value entered by user and assigning it back to student instance. To access the current values entered by user we use $event.target.value. On the click of button, update() method will be called that is using click event binding. Now we will create parent component that will use custom event binding. Find the component. Here we are creating an object of Student class. Method saveData() will be called in custom event binding. Find the HTML template used in our parent component. Look at the code, the variable updateEmployee declared in child component using EventEmitter will work as an event that is custom event. The event will be executed when the below line of code will execute. The property student in our HTML template binds the value to input variable in child component. Here we are getting two output, first is because of component property binding and second is because of custom event binding. When we change first name and last name in text box then by input event the student object gets changed and because of component property binding it is the same object reference of studentObj that will also get changed. On click of update button update method of child component is called and hence emit() method will execute that will generate updateEmployee event in parent component and that will call saveData() method because of custom event binding.